What does social media provide? Social media provides you with a free opportunity to market yourself. All the major social media platforms are free to use and can reach a global audience. This fact alone is the reason why social media is a required tool for artists. If you are taking your career seriously then you are going to be looking to take advantage of every opportunity to advance your career. Social media provides you with opportunities that no other platform can provide. To build a career as an artist, you need people to listen to your music, people to enjoy listening to your music, engage with your fans, and build relationships. Before you can do any of these things, you will need the attention of your target audience. If you do not have the attention of your target audience, then you are not going to build a successful career. It is that simple. Today, the attention of your audience is on social media. Social media provides a large target audience that cannot be found elsewhere. The only time I would recommend for anyone not to put time and effort into social media is if you are not looking to build a career and are just looking to put out music. If you don’t care about gaining an audience, releasing music on labels, playing shows, being featured on blogs, or doing anything to advance your career, then social media is not necessary. If all you want to do is put out music and nothing else, then social media is not necessary. Why is it helpful as an artist? Social media helps you connect with your target audience. Social media platforms are built off of a community and this community is built off interactions, through text, images, audio, and videos. These four forms of communication can be used in all shapes or forms to send a message to your audience on a global scale for free. This is an incredibly powerful tool to have as an artist. 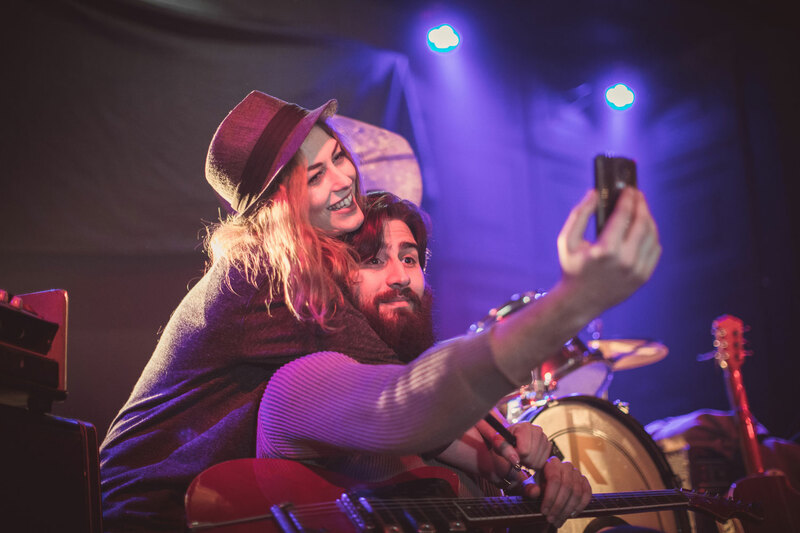 In the blink of an eye, you can share your latest track, chat with someone from China about your latest show, live stream your studio session, and sell tickets to your next show through images. The biggest building block for any artists’ career is their audience. Without an audience, you will have little to no hope of starting a career in today’s hyper competitive industry. There are three ways for you to use social media as an artist. I recommend using all three. 1. Build a Community: Building a community grabs the attention of your audience and keeps the conversation going on your social media platforms. More importantly, it helps you build a connection with your target audience. This community is what will make or break your career. Reach out to people individually – Doing this will help build a connection and trust, both of which are necessary for building a responsive and dedicated community. Send people direct messages, post on their wall, shout them out, or send them a video or voice message. Anything that is a direct line of communication to your audience will work! Live stream – Live streaming helps your audience get to know who you are as a person and gives your audience the ability to interact with you in real time. Live stream a Q&A, a studio session, getting ready for your next show, or anything that you feel will bring you closer to your audience. 2. Provide Value: Providing value is an important and often overlooked step when artists are trying to build a community and career on social media platforms. What exactly does this mean though? Providing value means giving your audience something that they find helpful, useful, or insightful. If you come across a person that is always helping you for no cost, then you will naturally like this person and feel thankful towards them. The key here is to not expect anything in return from your audience when you provide value. 3. Be Sincere: Many people on social media are fake. They lie about who they are, what they do, and create an appearance that everything in their life is perfect. People respond best to sincerity. This may sound incredibly cliche, but just be yourself. This will generate a positive response from your audience and help build trust within your community. If you are taking your artist career seriously, you must have a social media presence. Social media allows you to connect with your target audience on a global scale. By taking the time to build a community on the various social media platforms available, you will start to see an increase in interest for your artist project, reach more people with your music, and build the music career you always wanted. Thanks for the information. it has been great for me! This template for building a music career is overstated and wearisome. For centuries musicians have built music careers without social media. It has always been done and can still be done. Social media is a great tool if used properly. It is not a way to stand out, as it has become white noise in the over-stimulation of our culture. Social media recognition does not make a fan. It’s sad to me that so many think their thousand of drive-by followers on social media make them a success. Relationships with fans, building long-term loyalty, and recognizing and engaging with target audience can be done in so many more valuable and less shallow ways than social media can provide. I write about this regularly on my blog. Profound King. I am an independent hip hop artist – Slamz Da Goon from South Africa (underground) but I have been following these strategies. Just posted them on my Twitter for others to reach it. Much Respect. Thanks for the insight. I agree building a relationship with your audience is important. For so many years, artists were seen as untouchable and un-relatable on a personal level, now it is easier than ever to reach out to someone who written something that is valuable to you. Also, I agree with helping other artists, we will grow faster with each other’s support than we ever would on our own. Great article. I can attest that the social media strategies listed in the article work well. It’s my professional experience that these steps are needed in order to continue my success at community shows and events. I always make my communications stand out and be interesting to my audience. I believe in the give-aways too in order to get back more good will toward my career. Generally my audience loves my success when they know that they have had a part to play in it. Sincerity was one of your required statements in this article in order to make success work. I loved this article and will forward it to others who need the help as well. Thank you Daniel.